Work Projects of students of Chiang Mai Municipality School won the National Work Projects Competition with scholarships and certificates from Adisai Bodharamik, Minister of Education in 2004. 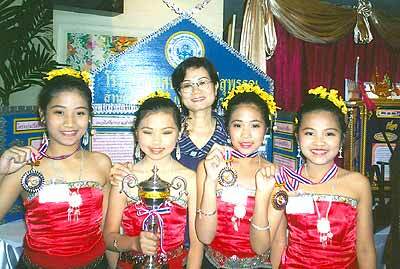 The winners of the first prize from Srisuphan Municipality School Chiang Mai. Boonlert Buranupakorn, Chiang Mai mayor, said that he was very proud of the students. 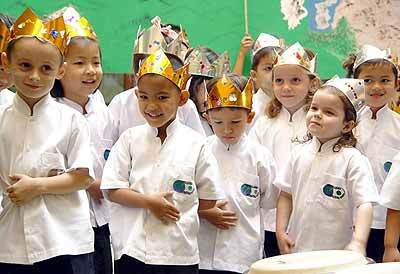 He encouraged all students and teachers to create new things and bring fame to their own school and Chiang Mai. He specially admired the teachers who advised these students. As the conclusion to their semester studies on ‘news’ and ‘writing newspaper articles’, Grade 5a and Grade 5b of Chiang Mai International School (CMIS) visited the Chiangmai Mail office. 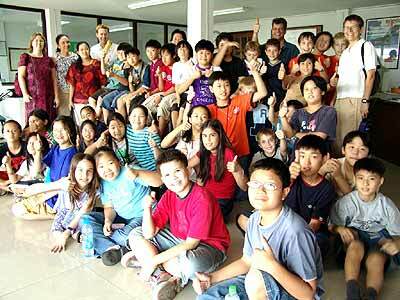 Grade 5a and 5b with Chiangmai Mail MD Michael Vogt after the question and answer session. Alison Doughty and Tim Daniel, homeroom teachers of 37 eager students had already provided their classes with more than the common knowledge on how a newspaper is produced, but Managing Director Michael Vogt was kept busy answering all the well prepared questions, to give the students more details and information about what makes a good reporter. During the past two years many interested classes from different Chiang Mai schools, universities and institutions have come to study at Chiangmai Mail to receive first hand information and training. Last week, the Prem Tiusulanonda International School held Book Week, “a celebration of books and the enjoyment people get out of reading,” according to head librarian Triesha Hueneke. Prem’s Junior School students round off the Book Week events. 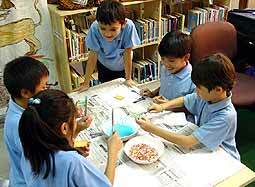 From Monday to Friday, students of all ages participated in many Book Week activities. There was face painting, storytelling, and a puppet play about Chinese myths for the younger children, while a visiting author spoke about her craft to several Senior School classes. For the event, the library was decorated as a medieval castle, in keeping with the theme of “Doorways Into Other Worlds.” Students in the art department helped by creating sculptures of mythical beasts and legends to populate the halls of the library, while a cave was constructed near the entrance to “story corner” for the Junior School students. On Friday morning, at the end of Book Week, the Junior School presented a musical play about a boy canoeing on a river and meeting mythical creatures along his journey. Many students participated, including Grade Five who provided mood music with violins, drums, and a piano. Parents made up a significant portion of the audience for this first ever performance in the library’s outdoor atrium. Whether through art, music, or reading, Book Week at Prem was celebrated with style and enthusiasm by the whole community. Assoc. Prof. Dr. Thep Phongparnich, the president of Maejo University (3rd left) Dr. Sawat Sangbangpla (2nd left) signed an academic cooperation contract. Assoc. 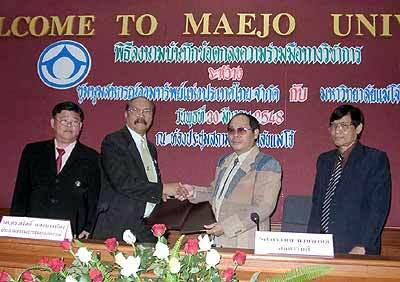 Prof. Dr. Thep Phongparnich, the president of Maejo University and Dr. Sawat Sangbangpla, the president of the Federation of Saving and Credit Cooperatives of Thailand Ltd., signed an academic cooperation contract. Maejo University would offer a bachelor degree course for staff of the cooperatives as no other government University offers this curriculum. Students of the Faculty of Architecture of Chiang Mai University designed architectural elements for the elderly and won a prize from the UN at the International Student Design Competition 2004 in New York, USA. Jatupong Kaewmuang, from the Faculty of Architecture of Chiang Mai University, led senior students at the conference and received a prize entitled “Integrated Communities: A Society for All Ages”. Ekaphap Duangkaew and Suthee Mekboonsonglab won the second prize and received a USD 3,750 scholarship. Witthawat Lertpaisansakul was a finalist in the single competition and Pandin Oonjanam and Suratchada Leujiangkam finalists in the group competition. The competition was organized by the International Council for Caring Communities (ICCC) with United Nations Program for Human Settlements (UN-HABITAT), United Nations Program on Aging, Department of Economic and Social Affairs and the Association of Collegiate School of Architecture (ACSA). It is an honorable international architectural competition that pays attention to the elderly in the world. It offers a chance to students in many countries to create ideas and design architectural works to solve problem or encourage people to care for the elderly according to each countries’ culture. On behalf of all elderly folk, the Chiangmai Mail also adds its congratulations to our young architectural students. One of the most frequently heard phrases at the Sixes was, “We cannot believe how the boys have progressed.” It was an opportunity during the Sixes week for CMSCA to show the participants, friends and supporters where their sponsorship and donations had been used during the last year. They were obviously impressed as a further 340,000 baht was taken at the CMSCA ‘shop’ this year! 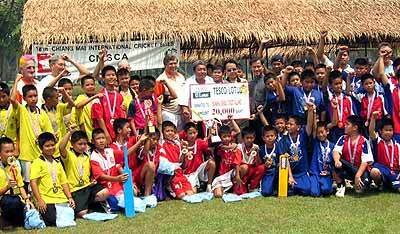 Grade 6 teams taking part in the Sawasdee Cricket Cup cheer a donation of 20,000 baht presented by managers from Tesco Lotus Hang Dong store (Kamol and Maytee - centre right) to CMSCA Chairman Parn (centre left) to help junior cricket development. 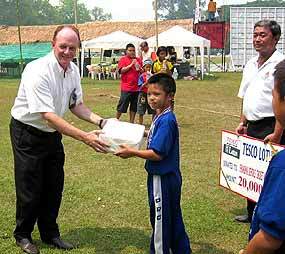 With several Sawasdee cricket playing schools in its area, the Tesco Lotus store is taking an encouraging interest in helping the program. Visitors on Tuesday, Wednesday, Thursday and Friday would have been able to see the Sawasdee Cricket Tournament in progress. Headed up by Peter Dawson and Eric Little this tournament shows the way children are taught cricket from grass roots. Eleven teams took part from seven schools. The standard of cricket was high with many boundaries scored on the relatively small pitches. Hashan Tillakeratne, a former captain of the Sri Lankan test side, presented the trophies and medals. On Tuesday and Thursday Grade 5 students played. In the high-scoring final, Mae Pong scored 291 runs to beat Saimoon who scored 262 runs. In the match for 3rd place, Montfort College just managed to beat Cheng Doi by 2 runs, 251 to 249. A team from Sahagon 2 also took part in the competition. Hashan Tillakeratne, a former captain of the Sri Lankan test side, presented the trophies and medals. On Wednesday and Friday Grade 6 took to the field. In a very competitive and high scoring final Saimoon just managed to beat Mae Pong by 1 run, 269 to 268. In the match for 3rd place, Montfort scored 266 runs to beat Pa Mai Deng, who scored 228. One of the best games of the tournament was between Montfort and Saimoon. The Montfort side bowled and fielded extremely well to hold the hitherto high scoring Saimoon team to 230 runs. Teams from Prince Royal’s College and Sahagon 2 also participated. The trophies and medals were presented by Maurice Bromley, the organizer of the Chiang Mai International Cricket Sixes Tournament. Tesco Lotus has always taken an interest in junior cricket, and we were very honored to have Justin Barnett, vice president of corporate affairs attending to see the boys’ progress. Mr. Barnett presented CMSCA with a cheque for 20,000 baht, and announced his intention to continue to support the work CMSCA does with the children. On the final day, Saturday, the crowd was delighted to see the ‘senior’ juniors (now our under 15 side) walk out onto the field looking like experienced cricketers. The boys put on a superb performance in an exhibition game that again proved to the sponsors that their money had been well spent. A very big thank you to all our supporters, whether it was purchasing a key ring or giving 66,000 baht to sponsor children, each donation gives us the motivation to continue the work we do. The Grand Opera Society of Chiang Mai presented its last opera viewing of the season on March 31, at Dr Howard C. Graves’ beautiful residence. Over 20 society members viewed the magnificent “Mephistopheles” opera from Arrigo Boito (1842-1918), who was born in Padua (Italy). Boito was not only a talented composer, but also a brilliant author and librettist. He achieved lasting fame in the opera world with his libretti to Verdi’s Otello and Falstaff. Next to Verdi’s well-known operas, Mefistofeles is among the most successful and fascinating examples of Italian opera produced in the late 19th century. Members of the opera society at the viewing of Verdi’s well-known opera Mefistofeles. We were in for a treat because this opera is romantic and funny. This particular production by the San Francisco Opera and performed at the Geneva Opera House in 1989 is the best you will see and features the magnificent Samuel Ramey. Actually, the credit for the success of this particular production can be evenly shared because everybody does an excellent job. Benackovแ has a beautiful, powerful voice and is a superb actress in the three roles she plays in this opera: innocent maiden; condemned murderess who struggles through her madness to beg for divine mercy and Helen of Troy in her state of grace. The stage director took up the challenge and succeeded wonderfully. 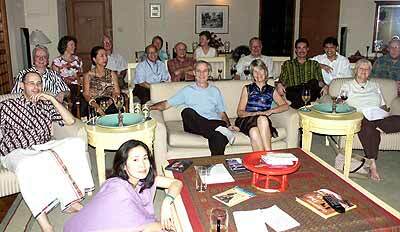 Viewing wonderful operas at Dr Howard C. Grave’s residence is a privilege which we all enjoy. There is such a good feeling of being together to share these western cultural activities. Furthermore, watching operas on a big screen with subtitles brings it all “alive” here in Chiang Mai. And the old tradition of “pot luck suppers” during the intermission always seems to bring out the best in people who put thought, love and care into their contributions. The next opera season should start in August. We usually meet twice a month. So if you are interested to bid for a viewing seat, please e-mail [email protected] or Dr. Graves at [email protected] yahoo.com. There are now over 60 society members. Those who are among the first to reply to an opera’s announcement are among the 20 invited to the performance. It is not too early to become a member: just let us know that you wish to be added to the register and give your email address and telephone number(s). 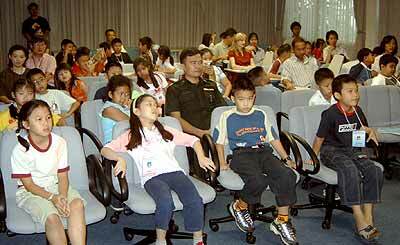 The Chiang Mai Air traffic control center held its annual “Aero Thai Summer Camp 2005”. This camp has been organized for eight consecutive years with the objectives of offering knowledge and fun to the youth in Chiang Mai, inviting them to apply experience gained from the camp in real life, e.g. a star can be your guide whenever you are lost, and survival supplies after facing an accident, among others. On March 29, Grp. Capt. Seuboon Nanna, director of Chiang Mai’s Air traffic control, presided over the opening ceremony of Aero Thai Summer Camp 2005 at the Chiang Mai Air traffic control office.